Windows Vista x86 and x64 versions should we upgrade? Tablets: Android or Windows 8 and what screen size? Start up DVD Shrink and click the 'Open Disc' button. 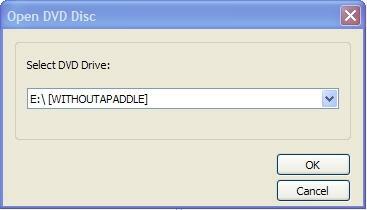 You should see the dialogue box below, select the drive that contains the DVD you want to open. Once you've selected the drive, DVD Shrink will scan for the DVD for the contents and display a progress bar like the photo below. After the DVD contents have been fully scanned you should see something that looks like the photo below. If you intend on making a complete 1:1 copy then skip to the settings section, most of you will want to click the 'Re-author' button in order to remove the unwanted elements from the DVD back-up. 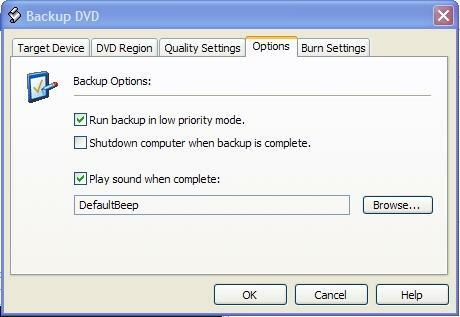 If DVD Shrink stops or reports any errors during this stage you may need to clean the disk or it may contain the 'New' copy protection system that needs to be removed using DVD Decrypter. Once you've entered the Re-author mode you'll see something like the photo below, drag the first item under the 'Main Movie' section to the left side pane called 'Re-authored DVD', you should now see 'Title 1' on the left side pane. 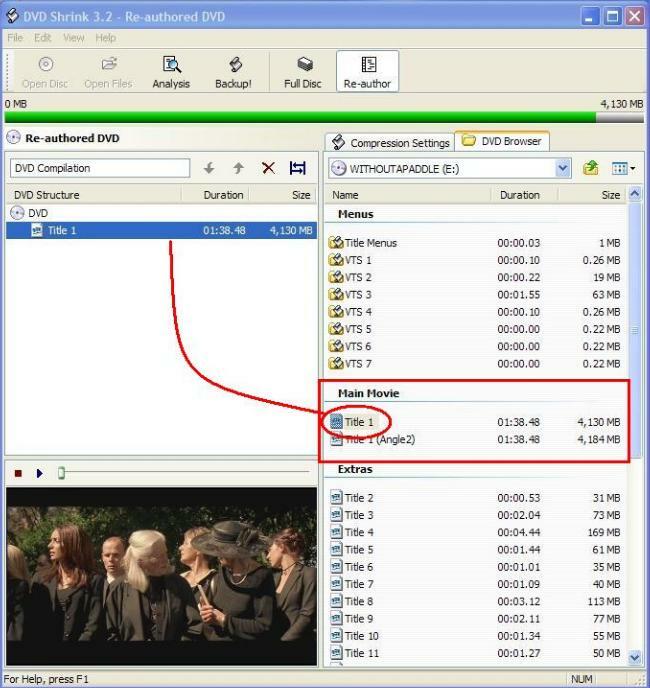 Now we need to select the 'Compression settings' Tab, in this section you'll be able to remove any languages and subtitles you don't want to be in the final DVD. Uncheck all the boxes that you don't need and hopefully the movie will be at 100% which means no compression is required, if compression is required you will see the amount of compression that is required. Once your 're satisfied with the settings in this section click the 'Backup!' button to continue. 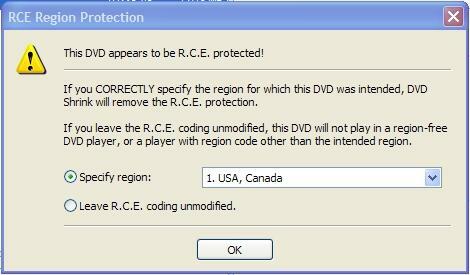 You may see a window like the photo below about R.C.E protection set the region to '1. USA, Canada' or the region that is applicable to your location and press 'OK' to continue. The next window will contain all the Backup DVD 'setting tabs' you need to simply check each 'Tab' against the following series of photos for the best settings to use. 'Target device' should be a local hard drive, you can write an to a '.iso' image file or even write directly to your DVD-R but writing the files to your hard drive ensures you don't waste any DVD's and allows you to verify the finished DVD before writing for any errors. Choose the location and directory name to be used, don't hit the 'OK' button until you've checked the settings of all the 'tabs'. The 'DVD Region' tab should be set to 'region free' unless you actually want the DVD to not play in all regions, if that's the case check the regions you wish the DVD to playable in. Under the 'Quality Settings' tab you should check the box where it says 'Perform deep analysis before back-up to improve quality'. Note this option will be grayed out if no compression is needed. The section titled 'Quality Enhancements' should be left alone as enabling it will cause the program to take 3-5 times longer to process and the difference in quality is neglible. The 'Options' tab will look like the photo below and are best left at the default options, you are welcome to change them to suit your needs, if you decide to uncheck 'Run backup in low priority mode' you may see an increase in processing speed but at the expense of other programs not responding well. Next is the 'Burn Setting' tab but since you choose to put the files to the hard drive the options will be grayed out, not much can be done here. Now you can press the 'OK' button to start the whole process, if you choose the 'Perform deep analysis before back-up to improve quailty' mode and compression is needed you will see a progress dialogue box similar to the photo below. Here the program is deciding which frames will receive what level of compression based on the scene, this allows frames that need it to have less compression than frames that can be compressed more due to the content. This process can take 30-90 minutes depending on your processor speed. Now the program will start the 'Encoding' stage and apply the settings it obtained from the previous stage to the files as they are copied to the destination folder you choose on the hard drive. 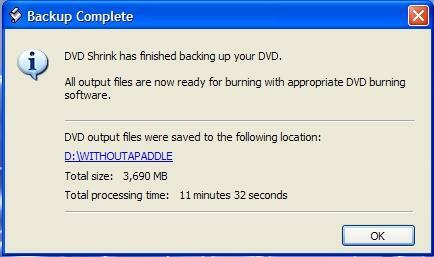 This can take another 30-90 minutes, obviously if your DVD needed no compression it will be much faster. When the process is complete you will see a window like the one below.